Franken not the candidate? Also GOP loses a bunch of seats 2008. Thus, the war is lost…. I disagree. Such an interpretation of the facts of the “Surge” in Iraq is madness in my opinion. Yes, the data clearly shows an increase in the number of attacks on coalition forces. My thoughts are “of course.” When you prepare to engage the enemy you shouldn’t be surprised when you engage the enemy. The fact Iraqi civilians and Iraqi security forces are better off than they were before the troop increase is an excellent trend. The goal should be a stable and (relatively) peaceful Iraq. 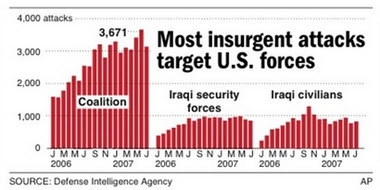 These numbers show engaging the insurgents in Iraq has moved us towards that goal. Tim Pawlenty, underestimated by many, signed a 157 million dollar relief bill for the flood disaster and did it by keeping the DFL controlled legislature in check. At one point, the governor and legislators had been considering a nickel-a-gallon gas tax increase, a transportation bill, a $200 million bonding bill and some local government aid to tamp down property tax increases. But after weeks of failed talks, momentum stalled and leaders were able to agree only to focus on natural-disaster relief. On Tuesday, DFLers and the governor traded accusations over who was to blame. DFLers said Pawlenty had caved to pressure from no-tax-increase conservatives. “The right wing got revved up, and Gov. Pawlenty started bobbing and weaving,” said Sen. Scott Dibble, DFL-Minneapolis. Pawlenty spokesman Brian McClung retorted the impasse was “due to the DFL’s insistence on massive tax hikes” to fund transit projects. Two things happened which prevented a tax hike. The first was a poll which showed Minnesotans opposed a tax increase. This put Pawlenty into a position of power as he soon back-tracked from his initial willingness to raise the gas and was able to force the DFL to play by his rules. The second thing that happened was the DFL was simply unable to control itself and the obvious weakness of the DFL leadership when negotiating with the Governor were put on display for all Minnesota once again. This session may not seem like a big victory but it is. The Governor forced the legislature to meet on his terms, he avoided raising the gas tax and scored another victory over his detractors and the opposition party. If you haven’t yet, listen to Bob Davis’ interview with Bjorn Lomborg (Monday in the 9-10 hour). Lomborg has authored another book for the skeptical environmentalist, this one on Global Warming. Richard Ramey always knew what he was going to be. Once, while in the third grade, his teacher asked him what he wanted to do when he grew up. His response? “I�ll go to war and fight” Concerned by his answer, his teacher called his mother, Julie Ramey. She told her “No, that’s my son”. SSgt. Ramey was killed when insurgents attacked his and other convoys in Mahmudiyah, Iraq. In a statement released through Fort Knox, the Ramey family said, “He was adventurous and smart, combining both qualities in what he did for the Army. We knew his work was dangerous but also knew he wouldn�t have wanted to do anything else”. Wednesday Heroes are written by Indian Chris as part of a non-partisan effort to recognize the bravery of our men in uniform.